I have my latest piece of work all finished!. Back in July, I went to Barcelona for a little holiday, and I was stunned with how beautiful the city was. On my return, I wanted to produce some smaller studies of various parts of the city. 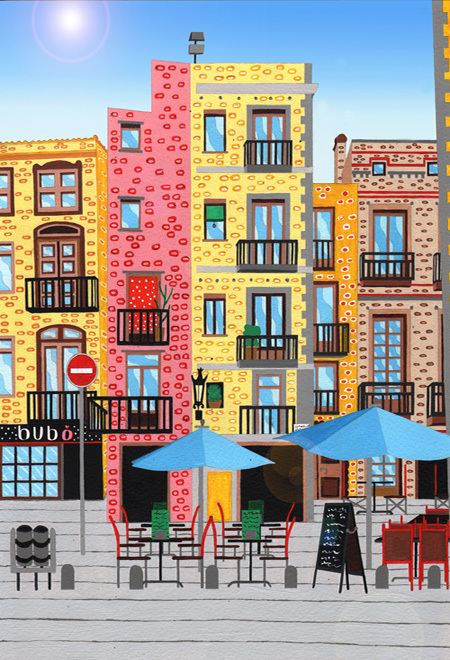 This painting, titled ‘Barri Gotic, Barcelona’, is a study of the stunning Gothic Quarter area in Barcelona. The area has a much more traditional feel to it, with lots of colour and traditional Spanish architecture and has so much history and tradition. When I first visited the area, I instantly knew the colours and architecture would be perfectly suited to my style. I really enjoyed producing this painting, and although working on a large scale will always be my preference, I am really starting to get used to working on a smaller scale. The painting has been produced first with pencil, and then acrylic paints, on specialist thick grade art paper. As always, the painting and limited edition prints are available to buy from Degreeart.com, the gallery that represents me, at the link below. Read more about… Barri Gotic, Barcelona.